The "tataki" is to brown the surface only slightly while keeping inside still rare. The taste of beef is condensed by making tataki, so you can enjoy both the crispy surface and tastiness inside. 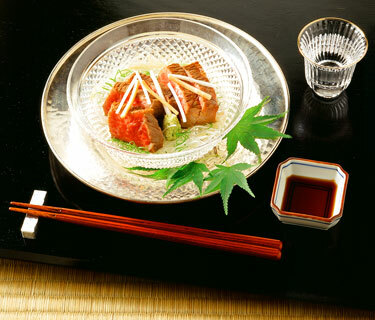 Savor the rich taste of Yamagata Gyu, characterized by its mellow flavor. 1) Sprinkle salt all over beef and rub. Place the beef prepared in (1) in a very hot frying pan and brown the surface. Plunge the beef in ice water. Take the beef out when sufficiently cooled, wrap inside a paper towel and set aside. 3) Cut leek and ginger in fine strips and soak in water. 4) Peel udo and carrot, cut in pieces approximately 2 in. (5cm) in length and 1/10 in. (2mm) in thickness. 5) Cut the beef paper-dried in (2) into slices about 3/8 in. (1cm) thick. 6) Spread leek and ginger on a dish, place the beef cut in (5), garnish with udo and carrot prepared in (4) and serve with grated wasabi. Yamagata Gyu is raised with a lot of love and in an excellent environment, which features feed rich with rice straw, rice bran and grains from Yamagata land well-known for rice production. Fine marbling, tender texture and creamy flavor due to low melting point of fat are characteristics of this meat. Brown the meat until you feel it may be overcooked. The brown color will fade slightly after being plunged in water. Be careful to cool the beef quickly after browning. When it is cooled slowly, residual heat will turn the color inside the loaf as well.